Bernard Charles Gee Robinson was born in Marston c1924. He was educated at Marston School and Grantham Boys Central School. During the Second World War he joined the Home Guard and worked as a sorting clerk-telegraphist at Grantham Post Office. He volunteered for the RAF as soon as he was old enough and was called up in 1942. He went to Canada for aircrew training, qualifying as a sergeant navigator in April 1943 before returning to England. 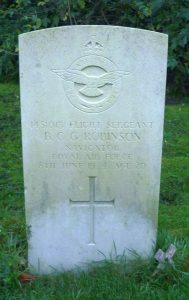 After completing advanced training he had been promoted to Flt Sgt and had just started operational duties with 107 (Mosquito) Sqn when he died on 8th Jun 1944 (aged 20). He was buried at Marston, with the coffin being carried by the local Home Guard. It’s not clear if he was killed flying. At the time (2 days after D-Day) the Sqn was conducting low level day and night bombing raids on German airfields. This required accurate navigation and timing including, coincidently, use of the ‘Gee’ radio navigation aid. Bernard was the only son of Bernard Clement Robinson (1895-1982), and Emily Lucy Gee (nee Harris, 1987-1978) of Marston Post Office. Bernard Clement was born in Foston, where he’d become an apprentice wheelwright to his father Henry Robinson. Emily was born in London, but Gee is a local name. Henry Robinson served his apprenticeship at Marston. After some years as a wheelwright in Foston he returned to Marston. He died in 1952 at Hill View, Grantham within a few days of 92nd birthday. He’d been ill when he was 70 and only been given 24 hours to live. He’d only been to cinema once in his life, for 3 minutes.